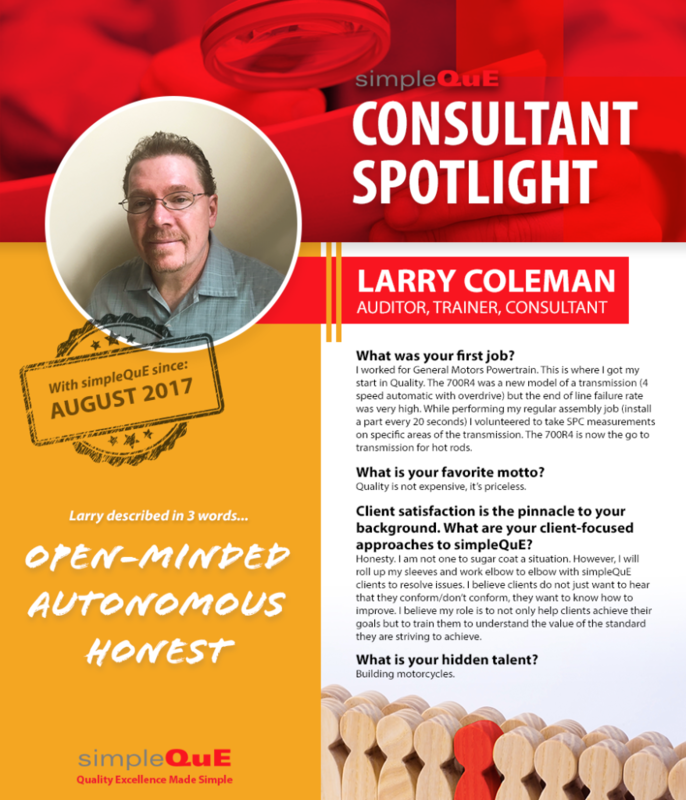 In the spotlight – learn about Larry Coleman, a dedicated simpleQuE consultant who rolls up his sleeves and works side-by-side with our clients to resolve quality issues. What is your position and what do you do for simpleQuE? What is your favorite QMS standard and why? AS9100 is my preferred standard. This standard not only covers Aerospace but also the Department of Defense. Ensuring that our warfighters receive what our government ordered for them and ensuring they have the the equipment on time and working properly is critical for supporting mission success. I worked for General Motors Powertrain. This is where I got my start in Quality. The 700R4 was a new model of a transmission (4 speed automatic with overdrive) but the end of line failure rate was very high. While performing my regular assembly job (install a part every 20 seconds) I volunteered to take SPC measurements on specific areas of the transmission. The 700R4 is now the go to transmission for hot rods. National Institute of Technology, Electronic Engineering. I live in Miamisburg, Ohio but was born and raised in Akron, Ohio. Do you have a favorite motto or personal mantra? Thinking back over your career, what is the professional accomplishment you are most proud of achieving and why? Next to getting my AEA, assisting Toyota with bringing Lexus production to North America (TMMC = Toyota Motor Manufacturing Canada) for the first time was an unbelievable experience. I also received the supplier of the year award for this activity. Client satisfaction is pinnacle to your background. What are your client-focused approaches to simpleQuE? Honesty. I am not one to sugar coat a situation. However, I will roll up my sleeves and work elbow to elbow with simpleQuE clients to resolve issues. I believe clients do not just want to hear that they conform/don’t conform, they want to know how to improve. I believe my role is to not only help clients achieve their goals but to train them to understand the value of the standard they are striving to achieve. Being a perfectionist requires continuous improvement. If you could go anywhere in the universe, where would you go? To Stuttgart Germany to tour the Porsche plant. Explain how simpleQuE is different from their competition. Focused, structured, supportive and simple. How would other people describe you in three words? Think before you speak. Not as easy as it sounds! What do you like most about working for simpleQuE? The simpleQuE team is very easy to work with and there is so much cross standard knowledge that if I am second guessing myself, I always have a resource I can reach out to for as a sanity check. simpleQuE clients embrace the information I provide and teaching/coaching clients is something I enjoy. Watching the reaction on people’s faces when they “get it” makes my day!